Dickinson Russian department students staged two performances of Anton Chekhov’s ‘The Bear’ in the last week of the semester. Level 200 students acted in an abridged version, and level 232 students put on the full 20-minute version. It was an entertaining experience both for the performers and the students watching, and memorizing the lines helped everyone master new vocabulary and grammar. 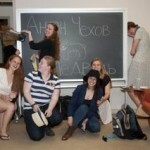 The following photographs and students’ comments give an idea of how it went. I haven’t participated in any sort of play since middle school, so I was a bit nervous in the beginning. 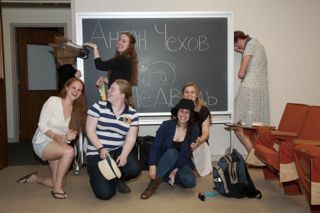 However, playing in “Medved” ended up being a wonderful experience and was so much fun. It also helped improve my Russian pronunciation. I had a really fun time learning and performing the play. It was easy for all of us to get into our roles and have fun, and I also improved my language and reading skills. This was a great experience!